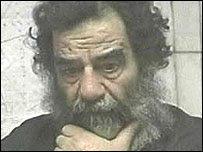 News reports confirm that Iraq's highest appeals court has upheld the death sentence for Saddam Hussein in his first trial and said it should be carried out within 30 days. The sentence "must be implemented within 30 days," Chief Judge Aref Shahin said. "From tomorrow, any day could be the day of implementation." The brutal Iraqi leader was sentenced to the gallows for the 1982 killings of 148 persons from Dujail, a Shi'ite Muslim town. The Iraqi constitution call for the appeals court decision to be ratified by President Jalal Talabani and Iraq's two vice presidents. However, some in the judicial system believe that isn’t necessary. Raed Juhi, a spokesman for the High Tribunal that convicted Hussein, said the Iraqi judicial system would ensure that Saddam is executed even if Mr. Talabani and the two vice presidents do not ratify the decision. "We'll implement the verdict by the power of the law," Mr. Juhi said without elaborating. An interesting situation, to be sure, and the next few days and weeks will be worth watching. As an avid supporter for the death penalty in certain limited circumstances, I would normally be in favor of ridding the world of Saddam Hussein at the earliest possible moment. However, in this case, I wonder if a more appropriate punishment for him would be one that allows him to live in a strict, limited and miserable environment for the rest of his life. Does he not deserve to suffer at least some of the misery he visited upon fellow Iraqis and fellow Muslims? I think so. I am not suggesting torture, although that idea is tempting to contemplate. No, I am suggesting a life in an 8x8 cell, with a basin, a toilet, a cot, a copy of the Qur’an, tasteless meals with water to drink, maybe a toothbrush and toothpaste, … that sort of thing. He should be shackled any time he is allowed out of his cell, such as for exercise, and he should be denied any contact with the outside world, meaning particularly that he never again can speak publicly. We would occasionally be shown photos or video of him, just so we will know that he is still alive, still paying the price for his evil reign.